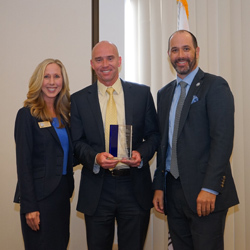 January 30, 2019 – Cypress, CA – Trident University International (Trident) has been selected as Cypress’ (CA) 2018 BRACE Business of the Year in honor of the University’s philanthropic efforts for its local community. Trident was recognized by Cypress Mayor Stacy Berry at the annual State of the City Luncheon on Wednesday, January 23rd. The BRACE Business of the Year award publicly acknowledges one of the integral and influential larger businesses whose contributions make Cypress a great place to live and work. Trident is frequently involved in efforts to support the military community and the Cypress and Long Beach areas. In recent years the University has hosted multiple events for the Gary Sinise Foundation’s Snowball Express and Operation Gratitude, as well as spearheaded fund and supply drives for veterans. In December Trident partnered with Joint Base Los Alamitos and the Los Alamitos Chamber of Commerce to raise money for the annual Adopt-a-Family program.